Great point, it is surely double-speak. Agree, meaning we need a new coach. Yup, barely finished over .500 but got better as the season went on (unlike some other ND university D-1 team) to win conf tourney and qualify for the NCAA. Hey, fair point. In retrospect, we almost seem to do better 5 on 5 than with a man advantage so perhaps you're on to something. To be honest, I'm gonna go down the middle between you and Mafia Man. Not sure they're a top 10 team as they are in the PW (probably should be around #12 or so). I say this; if this series is at home and the way we carried most of the play for at least 4 of the 6 periods then we sweep Denver. However, Denver gets great goal tending against us (all season long save for our 1 win), is a really good home team at mile high altitude, and we really struggle to score (I assume more so on the road vice at home) so really no surprise this wknd. However, we lose to Canisius twice so did not grab home ice. I gotta think it was sarcasm. Your season is on the line, you are offensively challenged, of course you pull the goalie. You guys nailed it. 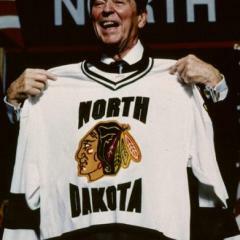 Am sick and tired anymore these last 3 - 4 season seeing talk/articles saying the recruiting class coming in has all these blah-blah players that are draft picks, highly recruited by other big name hockey schools (which is true, unlike FCS football), and they're putting up all these points at their pre-UND level. Again, either we're not very bright at recruiting anymore or these scorers/finishers are not progressing once they arrive. I gotta think it's the latter otherwise other schools would not be recruiting them too. It's gotta change, real soon. Yup, Denver lucked out only losing 1 out of 6 games to us this season. Huh?. All to do with puck luck and hot goalie. If Denver is a "bad hockey team" then WTH are we?! Have we scored any man advantage goals this year? Okay, so likely not on him then. Frustrating though is DU get 1 goal on a deflection on just 17 SOG but we have 32 SOG and can't even get 1 greasy goal thru traffic past the DU goalie. Groundhog Day.